Century Pools services all of your filter equipment including pumps, filters, cleaners, salt chlorine generators, and more! Century Pools offers a wide variety of pool liners to choose from and offers expert installation for your new liner. 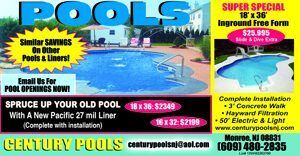 For help with your Pool Opening, Closing and Maintenance, please contact Century Pools at 609.480.2835 or fill out our Contact Form on the left side of the page.